All day free parking, and no need to sweat the hill! All day free parking is available at the Hahei Visitor Car Park (on the right as you enter Hahei, you can’t miss it, it’s well sign posted). The Park & Ride buses run continuously from 9am to 7pm, and only cost $5 return per person, $3 for a child and $10 for a family (2 adults 2 children) to get you up the big hill to the lookout and to the start of the Cathedral Cove walk. The top car park (Grange Road) is a pick up and drop off zone for the Shuttle only. Parking is prohibited on Grange Rd from the 1 October - 30 April. It is recommended that all visitors to Hahei Beach and Cathedral Cove use the Hahei Visitor Car Park. The cove is only accessible by foot or by water. 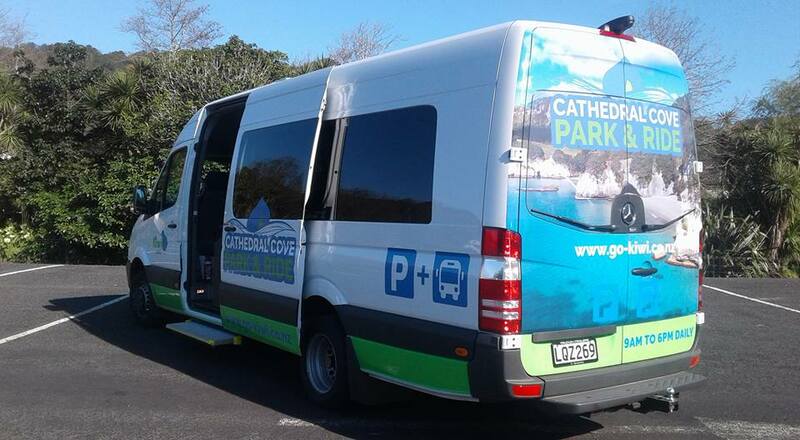 The Cathedral Cove Park & Ride buses bring you up the big hill to the top lookout. Check out the panoramic views of Mercury Bay and Te Whanganui A Hei Marine Reserve, then head down the well maintained track to Cathedral Cove. It’s a 45 minute walk each way, with the track mostly following the coastline; crossing scrub land, native scrubs and a pine forest. Along the way there are photo opportunities with dramatic views of spectacular coastal scenery. The first side track you come to is to Gemstone Bay, just a few minutes walk to a boulder bay where you can snorkel or swim following the snorkel trail. After that there is another side track which brings you to Stingray Bay, with it’s white sand beach, majestic cliffs and large boulders for rock hopping. Look out for stingray feeding. The cliffs are impressive, but please be wary of falling rocks..
A side loop track after Stingray Bay takes you through a grove of native puriri tree before rejoining the main trail. At the Cove itself you can swim in either of the two sandy beaches, accessed via a majestic natural rock arch, the Cathedral itself. Do not forget your camera! These beaches are fun for swimming and jumping off the rock island is very popular. Seen the Chronicles of Narnia movie, Prince of Caspian? You should recognise the beach then! Te Whanganui-A-Hei is part of a special area first claimed by Hei, a Tauira (teacher/skilled person) from the waka Te Arawa, some time around 1350 AD.